March 13, 2016 Vancouver, BC (ISN) – Canada Sevens impressed both on and off the field as 30,000 plus fans witnessed the Canadian Men’s Sevens team go 2-1, including an 14-12 upset versus fourth place Australia in opening action at BC Place in Vancouver, BC at the inaugural HSBC World Series Canada Sevens tournament. For Team Canada, despite playing for the first time in front of a home crowd, it was all business on the pitch. With the pains of Las Vegas Sevens performance perhaps still in the back of their minds, putting a good foot forward was on the teams mind including team captain John Moonlight. “ Too many mistakes, dropped balls, jitters. If we continue to let that happen we’re not going to be where we want do be, “ Moonlight would predict after game one versus Wales. Canada’s Pat Kay would shine on the first half for Canada, putting the home side up 14-0 early with two trys to further excite a packed, biased Canadian crowd at BC Place. Wales’ Jordan Williams would answer with a pair of his own trys in the last five minutes of the first half, using his speed to chase down kicked balls and beat the Canadian defense to the try line. Missed conversion attempts would keep Canada in front 14-12. Team Canada’s Harry Jones would score in the first minute of the second half to increase Canada’s lead, however costly errors leading to turnovers in possession would give a stiff Wales side hope. Trys by Wales’ Luke Treharne and Chris Knight would hand Canada their only loss on the day. 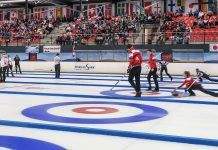 Canada took on number four world-ranked, and top B-pool seeded Australia in match two. Australia, cup runner ups in Las Vegas last weekend, were with all realistic expectation to hand Canada a stiff defeat, however, Canada was able to do the unthinkable in holding Australia to just 12 points in the game. A missed convert in the second half would eventually come to haunt the team from down under. Canada and Australia would spar in the first half with Canada marking the board first when Nathan Hirayama would run the ball in for the icebreaker. For Hirayama, sitting in third place in the most points scored this season, the successful convert would give him 15 tries and 58 converts on the season, and Canada a 7-0 lead. Australia would push back, scoring next try by Allan Fa’alava’au at 5:25 of the first half to pull even 7-7. Australia’s Tom Kingston would score the first try of the second half. A missed convert by James Stannard would give the Aussies a 12-7 lead. A late try with 28 seconds remaining by Canada’s Adam Zaruba would pull his team even. Hirayama, with no time left, would successfully kick a convert to give Canada the 14-12 win. Canada would avenge last weekend’s loss to Russia with a 29-12 win to put Canada into the Bowl Quarter finals on Sunday morning against Brazil. The task was clear for Canada. 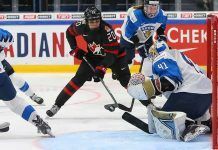 Beat Russia by at least 30 points and Canada would earn a berth in to the Cup quarterfinals. Canada Sevens Sean White would start the number counting with a try to go up 5-0. An inexplicable penalty to Admir Cejvanovic would send him to the sin bin, and Russia would take quick advantage with a try of their own to pull close 5-7. Harry Jones would add two trys and John Moonlight would contribute another to take a 24-5 lead. Russia’s Ivan Korotkov would silence the partisan crowd with a try, keeping Canada from a 30 point differential. Canada’s Harry Jones would score late, but that wouldn’t be enough to lift the home team to the Cup round. Canada will play Brazil with homes to advance in the Bowl round.